Skiing at Gore Mountain and the other slopes in the region are a popular wintertime pursuit here in the Adirondacks, but there’s plenty more to keep you busy elsewhere, whether you’re just not an avid skier, or if you’re just taking a break. From fantastic food to scenic views, the Adirondack/Capital Region has it all. Oscar’s Smokehouse: Stop by Warrensburg’s famous meat emporium for the ultimate in smoked meats and cheeses for après-ski, or on the way home. Stock up on specialty meats like smoked ham, chicken, duck and trout, as well as their huge selection of store-made beef jerky. Paradox Brewery: This is a great rustic tasting room, right at Exit 27 on I-87, between Pottersville and Schroon Lake, on Route 9. The brewery uses pure, clean Adirondack spring water for all their creations; sip some of the goodness and you will taste true brewing perfection. Check the website for what’s available on tap and in bottles/cans that day. Nettle Meadow Farm: This local farm specializing in goat cheese offers tours on Saturdays at noon, but the cheese shop is open daily from 10m. to 3 p.m. Stop in and taste favorites like their artisanal chevre and kunik cheeses; you won’t be able to bring yourself to leave without buying some to take home. Barkeater Chocolates Factory: Don’t forget to stop and buy some chocolate gifts. Local confectioner Barkeater Chocolates crafts some of the finest sweet treats in the North Country, including their decadent Grown Up Peanut Butter Cups and Sea Salt Downhill Darksider bar. Jacobs & Toney: Known locally as “The Meat Store of the North,” this Warrensburg institution is a quintessential local butcher, with one of the best meat selections around. It’s also renowned for making the most massive subs you’ll find anywhere in the region; a “whole sub” is enough to feed a small family, and won’t break your wallet. Experience the rush of snowmobiling over frozen Loon Lake or in the winter wonderland of the Adirondack woods, courtesy of C&C Adirondack Snowmobile Tours. They offer one- or two-hour tours for singles or doubles. Book your advance reservation online. Why not get a massage and take a nap? Have a licensed massage therapist come right to your room at Alpine Lodge, or enjoy The Oasis day spa in North Creek. In addition to massages, the spa offers facials, body scrubs and waxing. Spend the rest of the day having lunch, dinner and/or libations at one of the many great options in town. Check out the local shopping, too: Especially the Adirondack rustic furniture, housewares and gifts at Hudson River Trading Co., and the nice selection of antiques and collectibles at Foothills. And keep an eye out for the bald eagle often seen looping out over Main Street and the river! Spend some time looking for deals on lift tickets if you haven’t purchased them already. There are websites like Liftopia with deals on tickets, but your best bet is to purchase multi-day tickets at the ticket window, or better yet, a ski package with local lodging. Your multi-day ticket is reciprocal at Whiteface (but you must purchase it and ski the first day at Gore), which is only a magnificent 1.25-hour drive from Gore. You can also take that multi-day ticket and enjoy a few runs at the Ski Bowl under the lights. The kids will especially love it. You also may wish to look into getting a student or Empire Card if you are coming up multiple times during the winter. Check out the snowshoe trails at Natural Stone Bridge and Caves in Pottersville, which offers 14 miles of trails and two mountains. Their trails feature the largest cave entrance in New York State and the popular waterfalls. Trail fees are $15 per adult and $8 for children. Snowshoe rentals are $5. There’s also a nice fire to warm up by, and evening hours for snowshoeing. Drive over to Brant Lake via Route 8 (make sure you go around the backside of Palisades Road) and drive over the mountain to Hague, and then back down Route 9N to Bolton Landing. Stretch your legs there and check out the nice shops, or get a drink or dinner at any of the fine Bolton restaurants along Main Street. Then go sit at the park and enjoy the magnificent view of frozen Lake George in its icy splendor. Take the family for a winter safari, for a journey from the ordinary to the extraordinary! 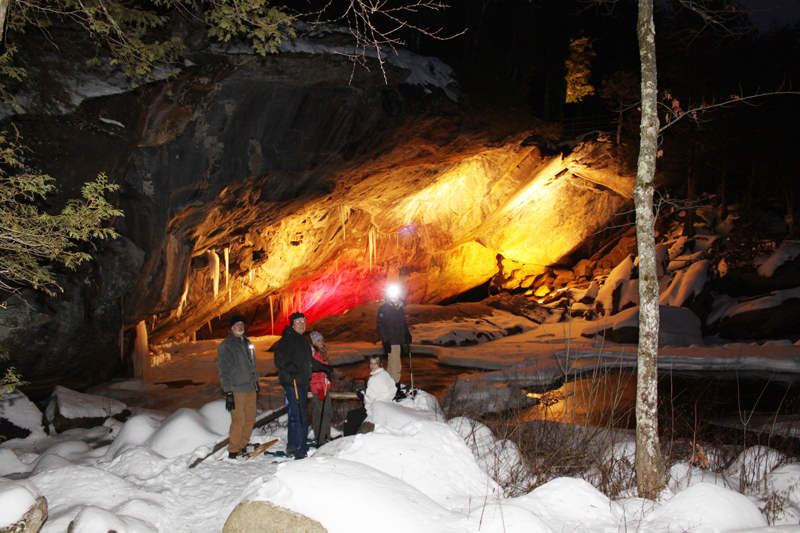 Hire a guide from Adirondack Mountain and Stream to take you snowshoeing, hiking or cross-country skiing to places that only the locals know. It will be a day trip they will talk about forever. Take a day trip up to Lake Placid. It’s a beautiful 1.25-hour drive north. Once there, window-shop down Main Street, stop for lunch at any number of great luncheon spots, then go to the top of the ski jumps and watch the ski jumpers or aerial freestyle skiers practice or compete. Check out the luge or bobsledding, and maybe even take a bobsled ride yourself. Save room for a piece of pie at The Noon Mark Diner in Keene Valley on the way home. For some very cool and very free fun, check out the free skiing (rope tow) at Chestertown’s Dynamite Hill. They have lights for nighttime, a warm-up hut, a skating rink and cross-country ski trails! The sledding there is also awesome. Bring sleds, saucers, toboggans, etc., or pick some up at the local hardware store. Before or afterward, stop at Main Street Ice Cream, The Odd Duck, Panther Mountain and/or The Bullhouse to refuel and refresh. For more free cross-country ski trails or snowshoe trails, check out the Warrensburg trails along the river on River Road, off Route 28 heading south. There is also the Caroline Fish Trail System in Chestertown, on Route 8 between the light in Chestertown and Exit 25 off I-87. The only thing better than an Adirondack ski trail, is a free ski trail.